They that have pow'r to hurt, and will do none, That do not do the thing they most do show, Who moving others are themselves as stone, Unmovèd, cold, and to temptation slow, They rightly do inherit heaven’s graces, And husband nature’s riches from expense. They are the lords and owners of their faces; Others but stewards of their excellence. The summer’s flow'r is to the summer sweet, Though to itself it only live and die. But if that flow'r with base infection meet, The basest weed outbraves his dignity. For sweetest things turn sourest by their deeds; Lilies that fester smell far worse than weeds. And manage nature's riches so that they are not wasted. Others are only the caretakers of their virtues. Although by itself it only lives and dies. The lowliest weed surpasses its dignity. Lilies that are rotten smell far worse than weeds. Kim, Suzy. "Shakespeare's Sonnets Translation." LitCharts. LitCharts LLC, 11 May 2014. Web. 25 Apr 2019. Kim, Suzy. "Shakespeare's Sonnets Translation." LitCharts LLC, May 11, 2014. 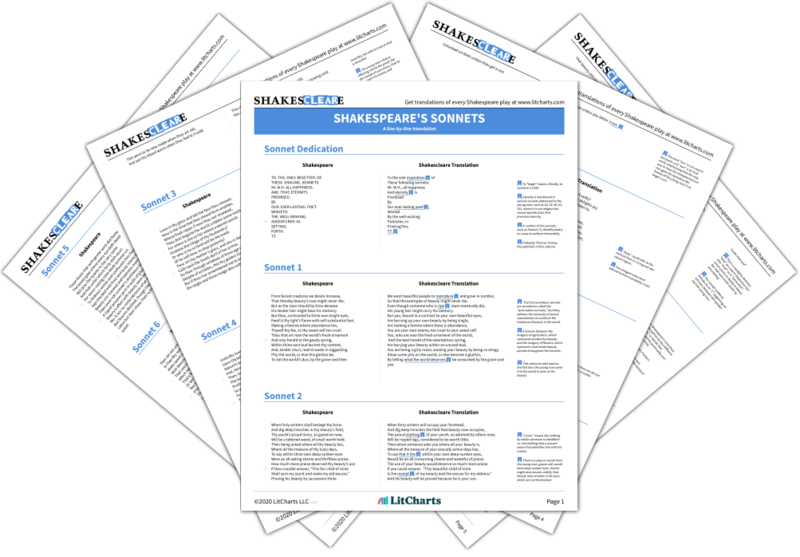 Retrieved April 25, 2019. https://www.litcharts.com/shakescleare/shakespeare-translations/sonnets.